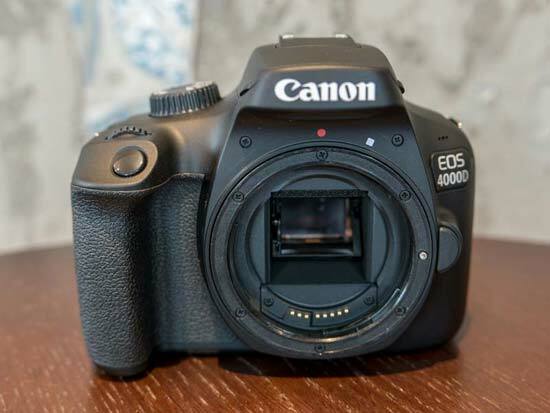 The Canon EOS 4000D (also known as the Digital Rebel T100 in North America) is Canon’s cheapest ever DSLR camera and is aimed squarely at first-time interchangeable lens camera buyers. 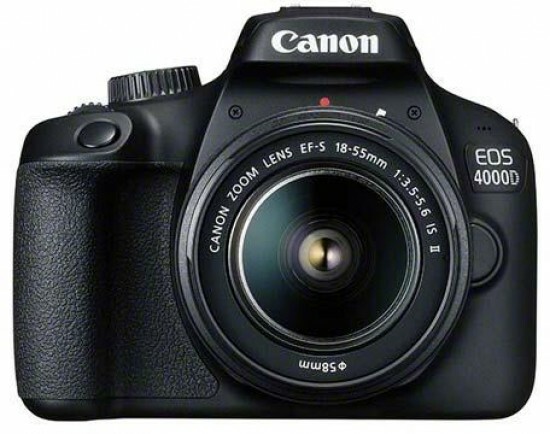 As with the EOS 2000D that we recently reviewed, the new Canon 4000D is heavily based upon the previous EOS 1300D model. There are also a few key differences between the EOS 4000D and the slightly more expensive 2000D - 18 versus 24 megapixels, a plastic lens mount versus metal, just wi-fi connectivity versus Wi-fi and NFC, a manual pop-up flash versus an automatic one, and a lower-resolution, smaller 6.8cm screen versus a a higher-resolution, larger 7.5cm LCD - but otherwise there's very little to tell them apart. The EOS 4000D inherits the same 18 megapixel sensor and Digic 4+ processor as the EOS 1300D, so image quality should be very similar. This also means that the 4000D retains the 1300D's modest 3fps continuous shooting rate and maximum standard sensitivity of ISO 6400 (expandable to 12800). Full HD video at 30fps is again available, rather than 4K recording, another concession to the aggressive price point. The Canon EOS 4000D is available body-only for £329.99 / €379.99, or comes bundled with the EF-S 18-55mm f/3.5-5.6 III kit lens for £369.99 / €429.99. 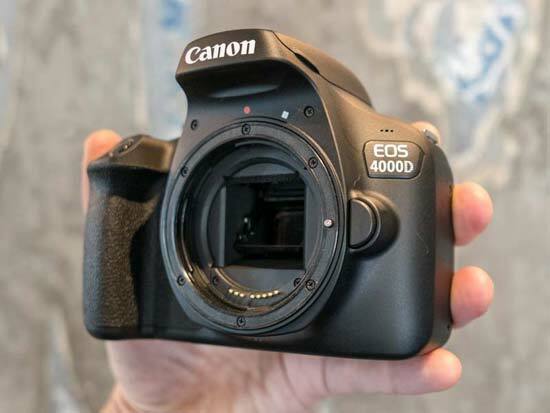 Externally the Canon EOS 4000D is virtually identical to the 1300D that it replaces, which we reviewed just over two years ago, and to it's more expensive sister model, the equally new EOS 2000D. The control and button placement is as good as identical on all three cameras, and so too is the camera’s physical size. At 129mm wide, 101.6mm high and 77.1mm deep, the 4000D has almost exactly the same dimensions, although it does weigh a little less at 436g ready to shoot, a whole 39g lighter than the 1300D/2000D. That also makes it ever so slightly lighter than a Nikon D3400, although the Nikon is still smaller than the 4000D in every dimension, measuring 124 x 98 x 75.5 mm. The only real ways to tell the EOS 4000D apart from the 2000D are the plastic lens mount and the blank, non-printed buttons. Although we kind of hate the idea of a plastic lens mount, out of the two cameras we'd probably pick the EOS 4000D and save a few pounds/dollars to spend on a nice camera bag or towards a second lens. The durability of the lens mount is much less of an issue if you're not actually changing lenses that often, which probably applies to most would-be buyers. Turning to the buttons, the EOS 4000D has all of the graphics printed on the camera body itself, rather than actually on each individual control, presumably to cut costs during manufacturing - you probably wouldn't even notice the difference if you looked at the cameras side by side. The 4000D’s light0weight plastic body feels fairly solid and fairly well built, though predictably for such a cheap DSLR, it isn’t at all weather sealed. The 4000D works quite well ergonomically, with a decent-sized rear thumb rest and the exposure compensation and playback zoom buttons positioned conveniently on either side of it. Note that the thumb rest is completely smooth rather than textured though, as on the 2000D, and is therefore a little trickier to get a firm grip on. The main hand grip is nice enough, but the finger recess is again a little shallow, which can make it difficult to grasp comfortably if you’ve got larger hands. 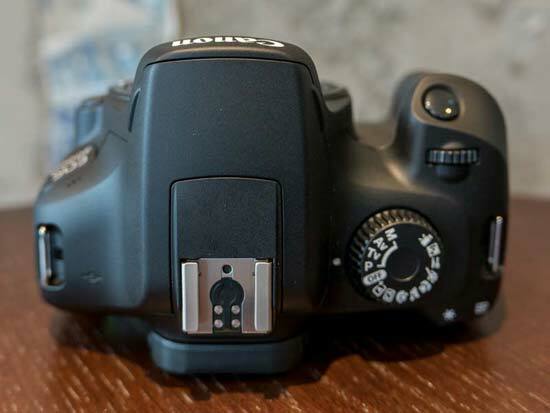 A primary selling point of the Canon EOS 4000D to first time DSLR buyers is its ease of use. Nothing has changed in this respect from the 1300D, but that’s no bad thing. 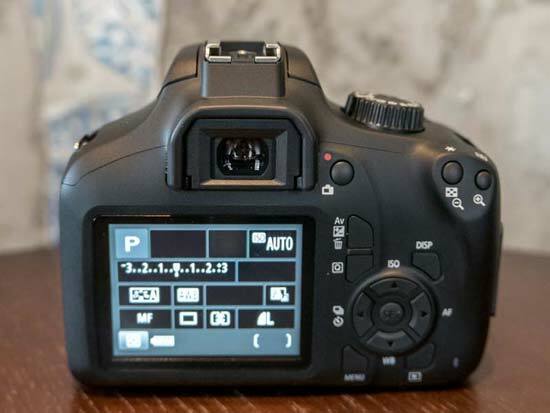 The 4000D still gets dedicated ISO and white balance buttons on the rear panel – physical controls you won’t find on a Nikon D3400 – while other key shooting settings like file quality and exposure modes can be accessed easily by pressing the Q button which activates the quick-access menu. This will also let you adjust the generous +/- 5EV of exposure compensation, but it’s quicker and easier to set this by pressing the dedicated exposure compensation button located immediately above the Q button whilst rotating the single, top-panel control wheel. As well as the clear and functional quick-access menu, the main menu is also well laid out and easy to navigate. A total of ten menu tabs split into shooting, playback, camera settings and a My Menu customisation tab can be scrolled across using the control wheel or rear panel directional buttons. The menu functions are mostly logically positioned, though a few features are less easily accessible. For instance, if you want to reveal the camera’s expanded ISO 12800 sensitivity, this is hidden away on page 2 of the Custom Functions menu entry. Another aspect of the Canon EOS 4000D which isn’t immediately intuitive is the mode dial. It’s cluttered with various scene mode settings, including Night Portrait, Food, Sports, Macro, Landscape, and Portrait presets. There’s also a Creative Auto mode that operates exactly as regular Auto mode, except you control the extent of background blur you’d like behind your subject by adjusting a virtual slider. All this does is adjust the lens aperture, so once you’ve learnt about aperture, good old aperture priority mode renders Creative Auto pointless. Aside from the usual selection of auto, semi-automatic and manual modes, the 4000D’s mode dial also includes the video mode. Returning to the rear panel and, along with the dedicated ISO and white balance buttons, the 4000D also offers a convenient drive mode button. This lets you choose between single shot, continuous, self-timer with a 10-second or 2-second delay, and also a continuous self-timer function where the camera will snap a burst of shots after an initial delay. Standard continuous shooting speed is unchanged from the 1300D and is still a rather sluggish 3fps, mainly due to the 4000D using essentially the same rather dated Digic 4+ image processor. Another area where the new Canon trails the Nikon D3400 is video, although the difference is slight. Both cameras will shoot Full HD 1920 x 1080 pixel resolution, but where the D3400 can do so at 60fps, the 4000D can only manage 30fps. Shooting a video first requires you to rotate the main mode dial to the video position, where you can then press the Live View button located alongside the viewfinder to start and stop recording. The 4000D also includes a Video Snapshot feature, whereby the camera will record video clips lasting two, four or eight seconds and compile them into a Video Snapshot Album (a montage sequence) with the option to add your own background music. A lot of of the hardware inside the Canon EOS 4000D has been carried over from the 1300D, but unfortunately that doesn't include the rather horrible LCD screen. The size is a little smaller at 2.7 inches, but the big story is the resolution, which has changed from a respectable enough 920,000 dots on the 1300D to just 230,000 dots on the 4000D. This has resulted in a grainy, washed-out display that makes it very hard to tell with any great accuracy what you've just taken a photo of (or about to). And as you'd perhaps guess, the screen still doesn’t feature touch sensitivity, all of which will likely disappoint the camera's main target audience. The 4000D has built-in Wi-Fi connectivity , but this time without NFC pairing, which the EOS 2000D additionally offers. The wi-fi system uses Canon’s Camera Connect mobile app to enable wireless image transfer and remote camera control. Connecting your smart device is painless, and once linked, the 4000D can be controlled remotely with very little signal lag. The app also lets you control shooting functions like ISO sensitivity, exposure compensation and the drive mode. When it comes to sharing your shots, the Wi-Fi link transfers a full resolution image almost instantly, although image previews do take a couple of seconds per shot to preview properly when scrolling through your memory card’s images. When it comes to shooting, the Canon EOS 4000D will switch on and fire a shot in around 0.7 seconds, although it takes a second or so longer for the LCD screen to display anything. Focusing speed is largely dependent on your choice of lens. Our 4000D test sample came paired with the EF-S 18-55mm III kit lens, which is a competent enough performer, but crucially doesn't offer built-in image stabilisation, unlike the EOS 2000D's kit lens. Whichever lens you choose, the Canon EOS 4000D’s 9 AF points are well spread across the image frame, and though only the central point is the more accurate cross-type, autofocussing in our hands was quick and mostly accurate in all but the darkest conditions. Switch to live view and things get much slower though, with contrast-detect focussing requiring a second or so to establish maximum sharpness and correct focus. However, this needn’t be a major issue when using live view to compose and shoot shots like close-ups, where careful consideration and an eye for detail are more important than speed. Last but not least is battery life, which is unchanged from the 1300D at 500 shots from the LP-E10 rechargeable Li-ion power pack. As with so many of the 4000D specs, it lags way behind the D3400’s incredibly impressive 1200-shot CIPA rating. It’s also worth noting that the 4000D’s battery compartment on the bottom of the camera also contains the memory card slot, which is a little fiddly to access and can also be blocked completely by larger tripod mounting plates. The D3400's more conventional side-accessed card slot is much more convenient.